Snitker managed Gwinnett from 2014-16 (photo: Karl L. Moore), while Acuna Jr. played for Gwinnett from 2017-18 (photo: Will Fagan). 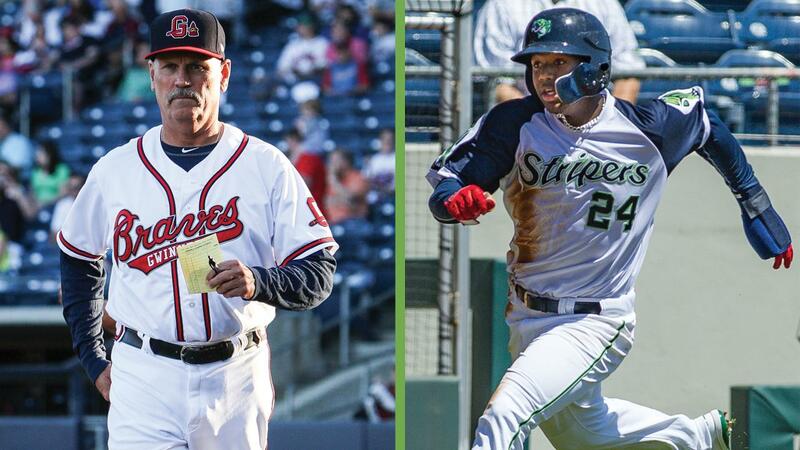 LAWRENCEVILLE, Ga. - The Gwinnett Stripers, Triple-A affiliate of the Atlanta Braves, congratulate former manager Brian Snitker on winning the 2018 National League Manager of the Year award and former outfielder Ronald Acuña Jr. on winning the 2018 National League Jackie Robinson Rookie of the Year award. Snitker received 17 of 30 first-place votes from the Baseball Writers' Association of America (BBWAA) to win the award for the NL's top manager on November 13, while Acuña Jr. received 27 of 30 first-place votes from the BBWAA to win the award for the NL's top rookie on November 12. Snitker, 63, went 161-164 (.495) in 325 games over two-plus seasons as Gwinnett's manager from 2014-16. He guided the Triple-A club to consecutive second-place finishes in the International League South Division in 2014 (65-77) and 2015 (77-67), earning the Braves' Bobby Cox Minor League Manager of the Year award for 2015. Snitker returned to Gwinnett in 2016 and was 19-20 when he was named the Braves' interim manager on May 17, 2016. Since joining Atlanta for his first role as a Major League manager, Snitker is 221-227 (.493) in 448 games spanning three seasons. He led the Braves to a 90-72 mark in 2018, capturing the franchise's first NL East Division championship and playoff berth since 2013. A member of the Braves organization for 42 seasons, Snitker is the first and only Gwinnett skipper to ascend to a managerial role in the Majors. He joins Hall of Famer Cox as the only Braves managers to win the Manager of the Year award. Acuña Jr., 20, batted .305 (95-for-311) with 16 doubles, two triples, 10 home runs, 47 runs scored, 36 RBIs, 16 stolen bases and an .831 OPS in 77 games with Gwinnett from 2017-18. The La Guaira, Venezuela native made his Triple-A debut as a 19-year-old in 2017, hitting .344 (76-for-221) with 14 doubles, two triples, nine homers, 38 runs scored, 33 RBIs and 11 stolen bases in 54 games to cap a season in which he earned Minor League Player of the Year awards from both Baseball America and USA Today. Acuña Jr. ranked third in the International League in batting during that 54-game stretch, and was named IL Player of the Month for August by MiLB.com (.364, 47-for-129, 4 HR, 24 R, 20 RBI, 7 SB, .931 OPS). Acuña Jr. entered 2018 rated the No. 2 prospect in baseball by MLBPipeline.com and opened the season with Gwinnett. He batted .232 (16-for-69) with two doubles, one home run, nine runs scored, two RBIs and four stolen bases in 17 games with the Stripers prior to having his contract selected by Atlanta on April 25. He returned to Gwinnett on a six-game rehab assignment from June 22-27 while on the Braves' 10-day disabled list with a left knee contusion and mild ACL sprain. Across his two stints last season, he batted .211 (19-for-90) with two doubles, one home run, nine runs scored, three RBIs and five stolen bases in 23 games. With the Braves, Acuña Jr. enjoyed a historic Major League debut, batting .293 (127-for-433) with 26 doubles, four triples, 26 home runs, 78 runs scored, 64 RBIs, 16 stolen bases and a .917 OPS in 111 games. His 26 homers led the team, and his eight leadoff homers set the franchise single-season record. He became one of five players in baseball history to hit 26 homers in a season prior to his 21st birthday and the 10th player in history to hit 25 homers and steal 15 bases in his rookie season. In Game 3 of the NL Division Series vs. the Los Angeles Dodgers, he became the youngest player in MLB history to hit a postseason grand slam. Acuña Jr. is the second former Gwinnett player to win NL Rookie of the Year, joining right-hander Craig Kimbrel, who pitched for Gwinnett from 2009-10 before earning the honors with Atlanta in 2011.